When you are in the Southwest, it is very tempting to cross the border for a little shopping and Mexican culture. Sonora, our Mexican state to the South, has an advertising campaign running on television enticing visitors to drive over the border with ease. You do not have to stop and register your car when crossing into Sonora, they promote..."Sonora Get's It!" With seniors traveling on a daily basis from Yuma to Algodones for dental care, prescriptions, and eyeglasses, it is hard to believe that eight Sonoran cities made the list of the 121 Mexican municipalities with the most violence per capita. But are tourist areas in Mexico dangerous? The U.S. State Department, in an article covering Spring Break in Mexico, advises common sense. “While the vast majority enjoy their vacations without incident some may die, hundreds will be arrested, and still more will make mistakes that could affect them for the rest of their lives," the representative said. Using some common sense will help travelers avoid these unpleasant and dangerous situations. The State Department issues travel alerts that can keep up updated on areas to avoid. RV trips into Mexico can be a great time but there are cautions that need to be advised. Caravan with people that know the language and the safe roads. If you break down, make sure others know and stay with you. If police stop you, go with them to the police station but take your license plates with you (to avoid theft). Stay in the usual tourist areas (gift shops, restaurants, hotel areas). Watch your drinking. A person appearing drunk is a sure target for theft. Be extra careful to follow the laws. Don't drink and drive, use illegal drugs, bring guns or drugs over the border. Take care of yourself. Bring water over the border to avoid dehydration. Wear sunscreen. Bring a list of your prescriptions and basic medical information with you. Have an emergency contact and phone number written down. If you need assistance, 911 service on U.S. cell phones will work in Puerto Penasco, San Carlos, and Guaymas. Know the hours of your border crossing point. Not all are open 24 hours. Visitors to the border region, including cities such as Tijuana, Ciudad Juarez, Nuevo Laredo, Nogales, Reynosa, and Matamoros should remain alert and be aware of their surroundings at all times. While this is an official head’s up, isn’t this good advice for any major city or area where the crime rate is higher than average? There are areas of Phoenix and other Southwest cities where you wouldn’t travel except with others and in the bright midday light. As of June 1, 2009, any U.S. citizen returning to the United States from Mexico through a land port of entry must present a U.S. passport or a U.S. birth certificate plus valid government-issued identification such as a driver's license. Passports and passport cards will become the only accepted form of ID as of June 1, 2009. Alternately, passport cards will be available starting in spring 2008 for U.S. citizens who don't travel by air or sea and just cross the border occasionally. 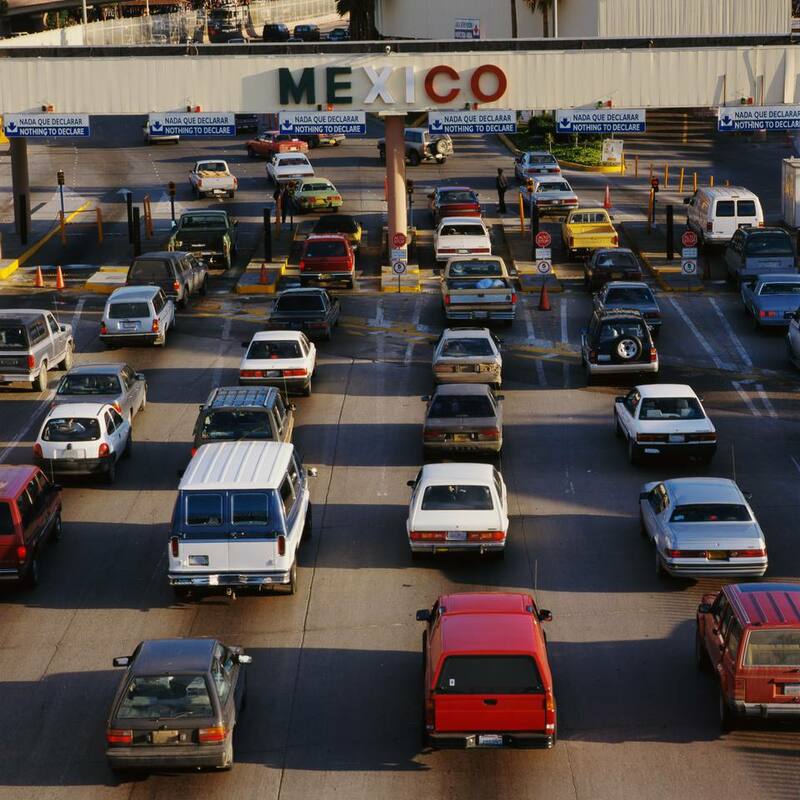 Except for travel to the Baja Peninsula, tourists wishing to travel beyond the border zone with their car must obtain a temporary import permit or risk having their car confiscated by Mexican customs officials. Carry a copy of your passport so that you have your passport number with you even if you are crossing the border with your passport. If you stay overnight, it may be wise to keep your passport in a hotel safe and carry to copy with you in your purse or wallet. If you stay in the main tourist areas, visit in the daytime, and cross back into the United States before late evening, you should have a great time. Of course, watch the news and State Department warnings and follow the rules. Don't judge the border towns by U.S. standards. You will see a different standard of living. Expect that and enjoy the fact that you are in a foreign country, just steps away from your own. Be cautious about eating and drinking. If you eat in a restaurant, make sure that you stick to cooked foods. Avoid fruits and vegetables and dishes made with cream and milk (it may or may not be pasteurized). Avoid ice in your beverages. A soda, beer, or glass of wine would be a good choice for something to drink with your meal. When shopping in markets or small shops, offer half the marked or quoted price and negotiate from there. It is expected that you will bargain. Be cautious about quality. What may appear to be gold or silver might just disappoint you as soon as you cross back over the border. Know and follow the Customs limits and declare what you have purchased. There are limits on cigarettes and alcohol. Make sure you check the rules before you go shopping.